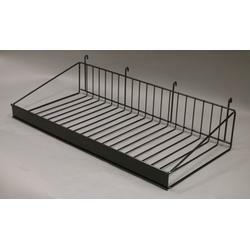 These gridwall shelving units connect to the gridwall by four rear facing hooks, for a sturdy display unit. Each shelf has a ticket channel to allow you to post price stickers or advertisements within customers easy view. Ticket channel also provides each shelf with a lip. Front lip prevents any items from falling out of the display.